A Number of Student Tracking Systems are Out There, It Turns Out; Monitoring More than Just Attendance? 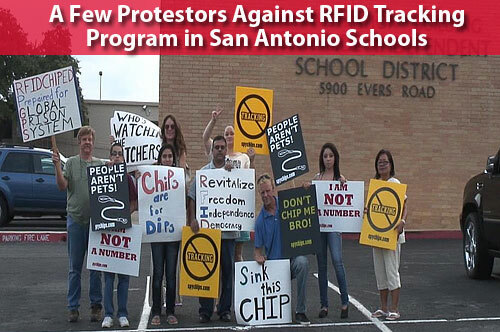 Tensions are building in several public schools in San Antonio in which a program to track students through use of RFID tags has set off local protests, as the school punish the kids who do not wear their RFID badges to school. The new tracking system was announced earlier this year and put into place Oct. 1 at two schools: John Jay High School and Anson Jones Middle School in San Antonio. Students are required to carry new student ID cards that have an RFID chip embedded in them, connected to a reader network that can identify where a student is within the building in real-time. Auto-ID based tracking systems for humans are actually nothing new. 15 years ago or so, a number of jails implemented tracking systems for prisoners using bar coded wrists bands, which were scanned at inmates entered each area, such as the cafeteria, library, etc. to track their whereabouts. SCDigest editor Dan Gilmore, in fact, says he was modestly involved in such a system in about 1996 for tracking prisoners at the LA County jail. More recently, several amusement parks have used special RFID enabled tickets to track attendees, mostly to help parents quickly track down their kids when they get lost or separated. But in the jail example, most people agree prisoners have simply lost most of their privacy rights. In the case of amusement parks, the tracking systems are "opt-in." But at the San Antonio schools, the tracking systems are mandatory, and students who do not bring their new RFID-based IDs to school are saying they are being punished to drive compliance. Many protested against the tracking systems when the program was first announced, and those protests have escalated now that it has been implemented and the enforcement measures are being used. State school officials say the program was initiated to stem rampant truancy in many schools across Texas, which not only impacts the students but also school funding formulas, in which schools lose money as truancy rises. If the program is judged successful, the RFID tracking system could soon come to 112 schools in all and affect nearly 100,000 students in San Antonio. Students who refuse to walk the school halls with the card in their pocket or around their neck claim they are being tormented by instructors, and are barred from participating in certain school functions. Some also said they were turned away from common areas like cafeterias and libraries. According to a local website, for example, Andrea Hernandez, a sophomore at John Jay, said the school has ignored her pleas to respect her privacy and told her she cannot participate in school elections if she refuses to comply with the tracking program. According to radio station WND, After Hernandez refused to wear an RFID chip, Deputy Superintendent Ray Galindo issued a statement to the girl's parents: "We are simply asking your daughter to wear an ID badge as every other student and adult on the Jay campus is asked to do." If she is allowed to forego the tracking now, the repercussions will be harsher than just revoking voting rights for homecoming contests once the school makes location-monitoring mandatory, he said. A few other students are said to be refusing to wear the IDs, but Hernandez, with the support of her father, is the focus at present. This kind of evolution (de-volution?) from using RFID to track goods to tracking people and other invasions of privacy is just what former Harvard professor Karen Albrecht and co-author Liz McIntyre predicted in their book Spychips: How Major Corporations and Government Plan to Track Your Every Purchase and Watch Your Every Move, published originally in the early 2000s. That book caused major controversy, to the point where SCDigest was told at the time that Walmart, in the midst of its then RFID program, would not participate in RFID events if Albrecht was a scheduled speaker. It appears that such RFID student tracking systems are becoming an actual market. The systems are popularly known as "Tag and Track," are being sold to schools system across the country by a variety of vendors, including AIM Truancy Solutions, ID Card Group and DataCard. Houston, it turns out, has had such a system deployed since all the way back in 2004. Austin also has a program, but it is not mandatory. Baltimore's school system has also deployed a system, and the Anaheim district is testing the system. The Palos Heights School District in Illinois has implemented the program with RFID tags attached to a student's back pack. How widespread these student tracking systems beyond these and a few others is not clear. It does not appear that these other programs have generated much public protest, with the exception of Brittan Elementary School in Sutter, CA, where a system implemented in the mid-2000s was uninstalled over some protests and legal action by the ACLU. Beyond tracking in the schools, the technology allows a school district, for example, to send automatic "wake-up calls" to students not found to have made the opening bell - but some are taking the systems even further, generating fears from some about the reach of these systems. For example, on Long Island, NY, Bay Shore students designated overweight or obese are being equipped with a wristwatch-like devices that count heartbeats, detect motion and even track students' sleeping habits. Wow. The Electronic Freedom Foundation has issued a statement warning about such a possible slippery slope. "An RFID chip allows for far more than that minimal record-keeping," the organization says. "Instead, it provides the potential for nearly constant monitoring of a child's physical location." It asks: "If RFID records show a child moving around a lot, could she be tagged as hyperactive? If he doesnâ€™t move around a lot, could he get a reputation for laziness?" How this plays out will be very interesting to watch. We will keep you posted. Do you think these student RFID tracking systems are going too far? Are you surprised there have not been even more public protests? Let us know your thoughts at the Feedback section below. Perhaps a compromise could be forged if schools were to use the chips in a check in/out system rather than real time tracking by employing tags with a limited range of 1-2 meters and readers at select points. Using reasonable control for the school environment versus the braceleted realtime system in a jail cited in the article is what is required. I see both sides, but they have to think a compromise is out there to bring the technology under control. What is mssing from both sides for me is trust, and trust in my view is earned through transparency in such a situation. The burden is on the school administration; they are teachers, not wardens...act like it! Teach compromise and collaboration, not megalomania and mandates.